We went to the see the Flint Creek Band at the USO on Ft. Drum last night. Not only are they a great country band and the dance floor was packed the whole time, but they have hearts of gold. The band sponsored a platoon in Iraq and they sent LOTS of packages with goodies, cds, and even miscellaneous medical supplies to help the locals. The band also made a CD of their original songs for the members of the platoon. I spoke with a couple of guys who were in the platoon and they said the band was a super sponsor! I got goosebumps when the band’s manager, Shannon, said she was so relieved the guys were back home since she felt such a bond with them. 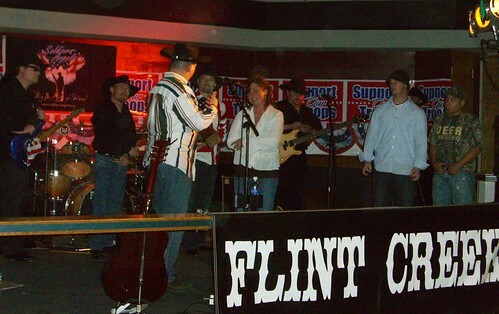 But they weren’t allowed to call her “mom” since she’s too young for that 🙂 It so warms my heart when I meet such supportive and giving people ~ we hear so much negative on TV and in print but there really are lots of genuine folks out there like the Flint Creek band who make a huge contribution to the soldiers. A BIG thanks to the band from me!! What a great story and what a great band! Makes me want to listen to their music. Great story. I agree with you ~ all we hear is how bad we are doing. It’s great they took the time to go see the guys when they came back to FT.Drum. FM looks good in that picture.